Pet Imagery is extremely appreciative of all the positive feedback regarding your experience with Lauren and her photography. Don’t be shy and let the world know what a great time you had during your session and with the photo results! Thank you so much! Pet Imagery turned our girl into model for the day! Lauren recently photographed our baby Sydney and I am so happy with the finished product. She did such a fantastic job! I could not be any happier with the photos. I was concerned Syd wouldn’t photograph well but Lauren took some fantastic shots. Lauren genuinely loves animals and it shows in her work. Lauren is a master photographer with the uncanny ability to capture the personality of your pet, unstaged, in a favorite setting. She has done four sessions with my mini dachshunds during the spring, summer and fall. The first three were with my aging senior Hamlet who was blind and his faithful companion Duke. Last fall she faced a new challenge as she photographed my frisky, squirmy pup Sofia while Duke supervised. 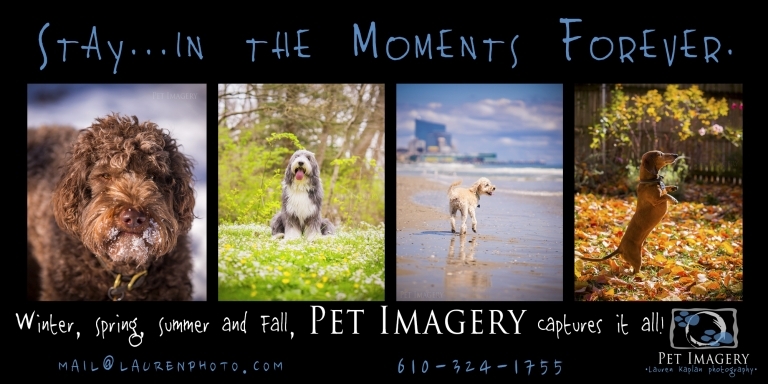 All her photos are amazing and a perfect way to preserve memories of your beloved pets. If you look carefully, you might fine a picture of one of my dogs! Lauren is an amazing photographer. Her caring and compassion comes through every picture. She was wonderful with my 3 dogs(the goon squad) and my pictures are beyond amazing. Allow her to photograph your animals. You will have treasures for life. Lauren did a photo session with my family and our three dogs last year. Unfortunately, our older dog Dobo recently passed away but luckily for us Lauren was able to capture a beautiful photo of Dobo and I. She captured our relationship and my dog's personality so perfectly. This photo has become our favorite and most cherished memory of our sweet dog. We still love every picture from our session, and Lauren was great with making our dogs comfortable! We are so thankful! My dog Fenway is beginning to get a little older. I hired Laura to make a keepsake of him which I will have forever. I had so much fun during the shoot! She was able to pick up on my dog's personality very quickly. I wanted photos of our everyday life together and she captured it with gorgeous artistry. Every picture is touched with emotion. I had her make me an album of my favorite shots. It has quickly become a prized possession. Spaz was a dear member of our little family. Haaving Lauren spend the day with us to capture his beautiful face and spirit on film was priceless. We didn't know it at the time, but Spaz was starting to get sick. The time we spent with Lauren was that much more precious when we lost him. Still, every day I see multiple reminders of that day and our dear Spaz. We knew how special he was but it was nice to show him off to Lauren who treated him like he was the only cat in the world! For a family Christmas present, my wife and I engaged Lauren to photograph our two siamese cats. One of our cats is quite ill and is not expected to live much longer, and we wanted to do this in order to have some vivid memories of him when he is gone. Lauren was most pleasant to work with. She was quite comfortable in our home and with our kitties. The two hour session was over before we knew it. We were thrilled with the resulting photos; they were everything that we had hoped for. When finally purchasing copies of the prints (being somewhat technologically challenged) I did have difficulties on Lauren’s web site setting up the order to include the items I wanted. I contacted Lauren and she really went the extra mile to help me with the order and ensure that we received exactly what we wanted. She is very professional and I would enthusiastically recommend her services to others. My husband was deployed to Afghanistan and complaining about a lack of pictures from home. As a surprise, I had booked a session with Lauren (whom I know from many moons ago from summer camp!) and she was amazing. She captured Lucy's playful side, her lazy side, and her sweet side all in the span of a couple of hours. On top of that, Lucy really loved her. We of course know how gorgeous our girl is, but it's amazing how Lauren really did capture all of her beauty. Needless to say, my husband was VERY surprised when I sent him the link to our pictures - a little piece of home, his little girl, sitting his email box! From 7,000 miles away he could see all of her personality and love on his screen and that is priceless to me. Thank you, Lauren!